In the early 1980’s I studied under the direction of Neeffe van der Schyff, professor of guitar, at the University of Cape Town, South Africa completing my Grade 7 Exams on Classical Guitar during that time. Over the years I attended master classes with Narcissi Yeppes, Carlos Bonell, Ernesto Betetti, Craig Ogden, Cheryl Grice, Gordon Crossley, Brad Richter & David Leisner. Since the early 1980’s, I have been performing Classical Guitar throughout the Prestigious Wine Estates & Hotels of South Africa and for the Top Corporate companies such as Shell, BP, IBM, Kodak & Alpha Romeo. I also performed concerts at the following South African locations: Joan St.Lindberg Arts Foundation - Natalie Labia Museum - The Wellington Music Society - The Nederberg Arts Festival - The National Arts Festival. Since my return to the UK, in 1998, I have been performing in the Stately Homes & Hotels in the English Countryside & South West Coast providing music for corporate events, functions and weddings. I started out as an Instrumental tutor in a music shop in South Africa in early 1980’s and thereafter had an intake of many private pupils from beginners to advanced in the years to follow . I also taught as a private teacher at schools in South Africa in the 1990's up to when I returned to my native UK in 1998. From 1998 onward I taught privately in Nottinghamshire / Derbyshire & Staffordshire going to pupils homes and teaching from home. 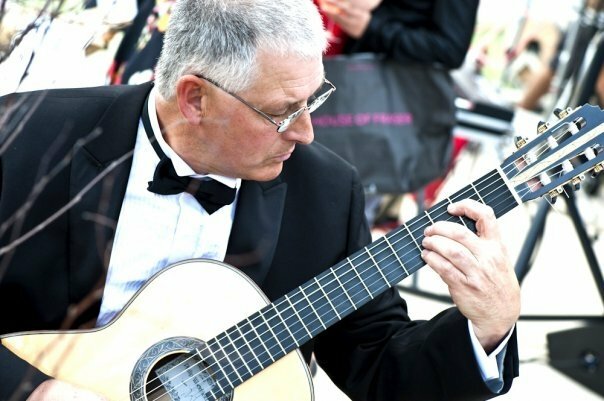 Between 1999 to 2005 I worked as a peripatetic classical guitar teacher for the Nottingham Arts support service, part of the Nottingham County Council . (now the Nottingham Music Hub). During this time I also taught at Private schools in Staffordshire including Lichfield Cathedral School and Brooklands School. In 2005 I moved to the South West (Cornwall) briefly working for the Cornwall Music Services as a peripatetic classical guitar teacher and then went over into my own private tuition from home or at pupils homes. During my time in Cornwall I have been performing for corporate events, functions and weddings. Relocating to Barton on Sea, Hampshire, I will allow me to concentrate my efforts on teaching the classical guitar to both private pupils and in Schools. Learning the Classical Guitar is the best way to get to know the guitar and experience its full potential. Mastering a correct technique and learning to read music notation does not have to be boring. The end result will be that you will be able to play your favourite songs sooner and better . Music is a language that is expressive and full of feeling. Not just a series of dots and notes. You will be able to play music from the past up to the present day . I have acquired considerable experience in teaching from all syllabuses over the years with a successful pass rate and I am happy to help you through Exam Grades or just help you play and interpret your music better. I have noted that a large number of guitar tuition books fail to offer enough attention to the development of the pupils R/H technique before incorporating the L/H. My aim is to supply enough exercises and pieces for the development of the right hand whilst at the same time helping the student make music. Attention is given from the start to producing a strong good tone making use of all dynamics and expression markings .To achieve this I advocate the use of Apoyando ( rest stroke ) focusing on the requirement of speed and attack needed for the control of dynamics and tone. Utilising the index , middle and ring fingers of the R/H and studying pieces that require unnatural string crossings is essential to achieving a solid right hand technique before the inclusion of the left hand. Incorporating the L/H allows an opportunity to consider the correct and relaxed posture when playing the guitar. The first of melodies will be making use of the placement of the 2nd finger of the L/H on the 2nd fret 3rd string. ( note A ) This will serve as an anchor for you L/H placement. Next comes the use of the 4th finger as it depresses the 2nd and 1st strings just behind the 3rd fret. This advice is rarely offered in most modern tutors. The benefit of this is a more relaxed technique allowing the students L/H fingers to naturally lie parallel to the neck of the guitar. The average tutor would use the 3rd finger in these instances thereby causing the left hand to drift away from the neck, creating problems from the start for the student for later on when the 4th finger is needed . Using the 4th finger here naturally pulls the hand towards the neck resulting in a more perfect hand position from the start. I have highlighted in this section the importance of being patient and taking enough time to establish a comfortable and sound technique at these beginning stages .Nothing is gained by trying to rush into playing chords and popular songs ( these require a considerable development of both hands ) before a solid foundation has been laid. Taking time in these initial stages of right and left hand development does not mean that the pupil is not advancing fast enough - on the contrary - Taking time to develop a solid technique will enable the student to progress more rapidly into whatever style of playing he chooses at a later stage. Lessons are charged monthly in advance and on a set time each week unless mutually agreed otherwise. If you would like bi monthly lessons these can be arranged . I realise life is a bit complicated at times but if reasonable notice is given we can accommodate any difficulties in your lesson time. However lessons otherwise missed will be for the students loss as I would have reserved an allocated slot for him/her which could have been allocated to another. I feel that this is reasonable and in keeping with all other teaching practises . Any lessons I miss due illness or otherwise will be made up at some later stage. I look forward to a happy relationship as we endeavour to share the “Art of the Guitar” together .